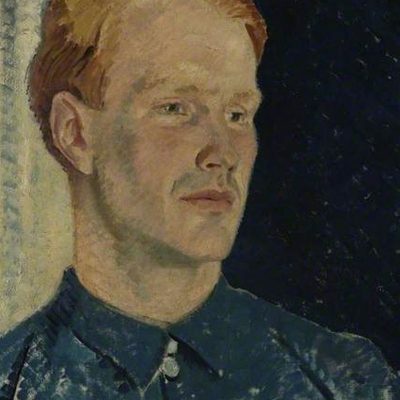 Before the outbreak of World War Two, Frank Mundy Coombs was well-known in art circles in London. Along with his partner Eardley Knollys, he ran the Storran Gallery before enlisting in the Royal Navy. Able Seaman Frank Mundy Coombs (D/JX 171434) served in the Royal Navy during World War Two. Born on 30th July 1906, he was the son of Frank Coombs and Louisa Isabel Coombs of Bath, Somerset. Coombs received his art education at King’s School, Bruton under Arthur Jenkins. Before the outbreak of war, he was well-known as a painter, architect, and art dealer. He qualified as an architect and worked for Hampshire County Council before moving to the island of Sark. There he met art dealer Ala Storey who owned the Storran Gallery in London. After her vacation ended, Frank returned to London with her and began to work at the Storran. Coombs’ progressive shows changed the entire business of the gallery, which once sold woodcuts and greeting cards. Soon, working with Eardley Knollys, the Storran exhibited works by Pavel Tchelitchew, Ivon Hitchens, Francis Hodgkins, and Victor Pasmore. Ala Storey sold her share of the gallery to Knollys for £300. The continued to exhibit works by Pablo Pcasso, Amedeo Modigliani, Maurice Utrillom, Glyn Philpot, Claude Monet, Pierre-Auguste Renoir, Paul Gaugin, Maurice de Vlaminck, and André Derain. Under Coombs and his partner Knollys, the Storran Gallery became an important avant-garde gallery. In 1940, Coombs’ work was part of a London Group Special Wartime Show at the New Burlington Galleries. It was evident that all the young people of what, before the war, was coming to be known humorously as the Cork Street Front, are carrying on energetically, courageously, and what is more important, with no loss of artistic integrity. There were characteristic works by Eileen Agar and Edna Ginesi, by John Tunnard, Ivon Hitchens, Robert Medley, Frank Mundy Coombs and many others of the younger generation. Thomas McGreevy, The Studio – 1940. After the outbreak of the Second World War, Frank Mundy Coombs joined the Royal Navy. He eventually became an Able Seaman and served on board HMS Caroline, a base in Belfast, Co. Antrim. He died on 15th April 1941 aged 34 years old. On that night, the Luftwaffe launched a devastating attack on the city. It would become known as The Easter Raid of the Belfast Blitz. Over 900 residents of Belfast, Co. Antrim died in that single night. Frank Mundy Coombs’ grave is in Glenalina Extension, Section D, Grave 128 of Belfast City Cemetery, Belfast, Co. Antrim. Killed by enemy action. Eldest son of Frank and Louisa Coombs of Radstock, Somerset. After the death of Coombs, his partner Eardley Knollys was heartbroken and never reopened the Storran Gallery. If you enjoyed this post on "Frank Mundy Coombs", please share with your friends and followers.